Even if you are not a fan of the Japanese car industry, you have probably heard the term “Kei Car.” Kei Cars are a Japanese class of tiny vehicles with engines well below the 1.0-liter mark and dimensions of a go-kart. The microcar was not invented in Japan. But in Japan, those vehicles have gained significant popularity due to the extreme lack of parking spaces and heavy traffic. Interestingly, after the Second World War, Japan could only make diminutive cars due to the shortage of materials as well as the high price of fuel. But over the years, Kei Cars have become the definitive cars of urban Japan. Most domestic manufacturers offer a wide range of models, from tiny roadsters to pint-sized sedans, SUVs, delivery vans and even supercars. So, it looks like there is a Kei Car for every purpose and buyer. As you’d expect, Japanese Kei Cars are rarely exported outside Japan. However, some of them are eligible for import to the United States. But, you can’t expect over-the-top performances from cars with a displacement of less than one liter. However, they’ve equipped some of them with turbochargers. And thanks to their small weight, they can provide a lively performance. 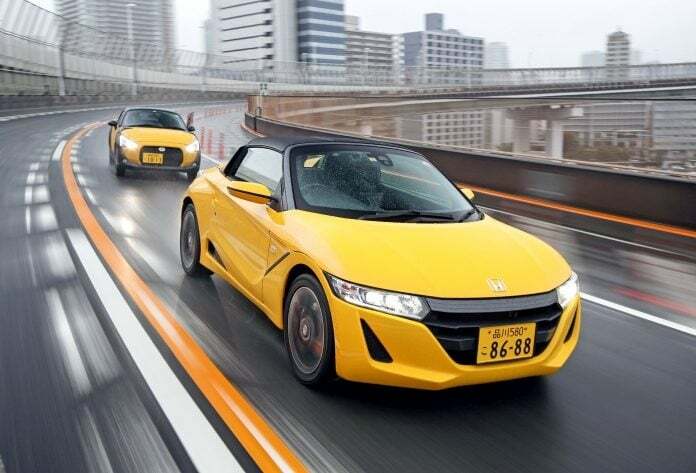 So, keep reading to find out more about the 20 coolest and most interesting Japanese Kei Cars. If you are limited by government-proposed dimensions, engine size limits and various other safety regulations, you must find new ways of designing cars. And a good example of that is Honda’s N-Box Slash. It brings an interesting design to the Kei Car class with its unique looks. Honda made a big effort to squeeze every last millimeter of usable space from this vehicle. Best of all, you could option it with red leather seats and even a modular interior, so you can turn it into a lounge.